All Peter Forsberg needed to start putting up some points was a change in linemates. 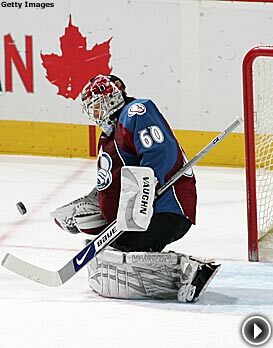 Forsberg was scoreless in his first eight periods since rejoining the Colorado Avalanche earlier this week. But coach Joel Quenneville changed line combinations after the second period of Saturday’s game against Dallas, pairing Forsberg with Andrew Brunette and Paul Stastny — and the chemistry was immediate. Forsberg set up the tying and go-ahead goals as the Avs rallied for a 3-1 victory over the Dallas Stars, Colorado’s sixth consecutive victory. Two-plus games without a point felt like an eternity for Forsberg. ''It's very tough coming in here this late in a season, so it's good to get a couple of points,'' said Forsberg, who signed a one-year deal Feb. 25 and played his first game with the Avs on Tuesday. Forsberg’s crisp pass set up Scott Hannan’s game-tying goal at 7:30 of the third period. His pinpoint pass from near the goal mouth to Brunette set up the winning goal at 10:12. Stastny hit the empty net with three seconds remaining. Jose Theodore, who’s playing his best hockey since winning the Hart Trophy for Montreal in 2001-02, stopped 25 shots for his sixth consecutive win. He beat a team that has owned him for most of his career, improving to 2-8-1 with two ties against the Stars. Theodore was pulled in his last start against Dallas on Nov. 16 after allowing five goals. The Stars have dropped three in a row after winning four straight and have seen their lead in the Pacific Division drop to one point over San Jose, which has three games in hand. Morrow went into the locker room early in the third period when his head slammed into the glass partition between the benches on a hit by Colorado defenseman Jeff Finger, who was called for interference. The play was similar to one last Saturday in which Colorado’s Ryan Smyth sustained a concussion and a shoulder injury that have kept him out of the lineup since then. The Stars didn’t score on the power play and appeared to lose momentum after that. They’re certainly pouring it on this month. The Avs are 4-0-0 this March after going 11-1-2 last March. Boston avenged a 10-2 loss to the Capitals on Monday largely because Donald Brashear lost his cool. Washington led 1-0 with 6:41 remaining in regulation time when Brashear was called for a double minor for high-sticking and another two minutes for roughing. John Erskine went off for hooking 1:13 later and Tom Poti was called for slashing with 2:56 left to create a pair of extended two-man advantages for the Bruins — who scored on both of them. "Sometimes that's how it goes," Brashear said. "You can't lose your focus and you can't lose your cool. He was coming at me and I guess I lost my cool a little bit." Zdeno Chara tied the game on a blast from the top of the slot with 5:01 remaining, and Marco Sturm banged in a rebound with 2:16 to play for the game-winner. "I admit Brash's penalties were dumb," Washington coach Bruce Boudreau said. "A guy that's been in the league that long should know that." The Bruins ended a three-game losing streak and moved back in front of the New York Rangers for sixth place in the Eastern Conference. The teams meet Sunday at Madison Square Garden. "We got pushed around the last time in Washington, and today we were ready for whatever happened," Bruins coach Claude Julien said. The Capitals took a 1-0 lead 6:17 into the game when Brooks Laich scored on a rebound after two shots by Alex Ovechkin. He fired a wrister from the left circle and charged in for the rebound before Laich beat goalie Alex Auld from the edge of the crease. The Bruins had only 15 shots through two periods and appeared destined for their fourth straight loss before the late batch of power plays. "It seems we were little tight, to be honest," Chara said about Boston's early play. "It's obvious when you're losing you don't feel as comfortable. But I have to give a lot guys credit. We handled it well and now we have to keep going. We have to keep playing like we did tonight." Patrice Brisebois, the only player left from the Canadiens team that beat the Kings in the 1993 Final, scored to trigger a three-goal second period as Montreal won in its first visit to Los Angeles in four years. Brisebois, now a part-time player on defense at age 37, opened the scoring at 5:09 of the second period with a one-timer that changed direction off the right skate of Anze Kopitar. It was his first goal in 36 games this season and came in his first appearance in the lineup after 10 straight games as a healthy scratch. The victory kept Montreal one point behind New Jersey in the Eastern Conference standings. The last time the Canadiens finished first in the East was 1993 — when they beat the Kings in a five-game Final for their last Stanley Cup. "I have great memories of those Finals, so it's always fun to play the Kings here — even though it's not at the Forum," Brisebois said, referring to the Kings’ former home. "That's a long time ago, 15 years already. I was young back then and I learned a lot from those playoffs and playing with guys like Kirk Muller, Vince Damphousse, Patrick Roy and Guy Carbonneau — who's my coach now. Jaroslav Halak made 35 saves in his first start for Montreal this season as the Canadiens won for the ninth time in as games. Brisebois, Saku Koivu and Guillaume Latendresse scored in a span of 7:34 in the second period to give the Canadiens a 3-0 lead before Rob Blake’s power-play goal at 16:53 got the Kings on the board. It was his 700th career point. Andrei Kostitsyn restored Montreal's three-goal margin with 16:11 left, and Kopitar made it 4-2 less than three minutes later. Los Angeles had two power-play opportunities after that but was unable to capitalize, and Tom Kostopoulos hit the empty net with 1:53 remaining. “I think we played a pretty good game," Kopitar said. "We were battling hard, but we gave up a couple of easy goals that we shouldn't have, and that's what cost us the game." Ottawa got well, at least for a night, with a road win against the NHL’s worst home team. The Senators avoided being swept on their four-game West Coast trip as Mike Fisher had two goals — his first in 19 games — and Dany Heatley and Antoine Vermette scored in the third period. Just as they had against Montreal on Thursday, the Coyotes blew a 2-1 lead in a 4-2 loss. Phoenix is just 14-17-3 at Jobing.com Arena but 20-13-2 on the road — a disparity that has its coach perplexed. The Coyotes remained five points out of a playoff berth in the West. Fisher’s shorthanded goal was the only scoring in the first period. He tied the game at 2-2 when he connected on a power-play goal at the 18-minute mark of the second period after Craig Weller and Peter Mueller had put Phoenix ahead with goals 1:31 apart midway through the period. Heatley scored the go-ahead goal, his 32nd of the season, on a power play 1:33 into the third period, and Vermette's rebound goal with 9:59 left made it 4-2. The Senators are now 2-3-1 since GM Bryan Murray fired coach John Paddock and went back behind the bench. They were coming off a 2-0 loss in Los Angeles on Thursday in which they had 40 shots. Philadelphia’s revival after a 10-game losing streak continued at the expense of the reeling Islanders, who surrendered four power-play goals and struggled with the man advantage. The Flyers improved to 5-1-1 following their losing streak and moved four points ahead of ninth-place Buffalo for the final playoff berth in the Eastern Conference, mostly thanks to their special teams. The Islanders fell seven points out of a playoff berth with 12 games remaining. Starting goaltender Rick DiPietro returned after missing three games following a death in his family, but having him back didn’t help on a night when the Isles’ penalty-killers didn’t do the job against a power play that was ranked second in the NHL but was 6-for-63 in its last 15 games. DiPietro had his ups and downs — and very little luck on a night when every bounce seemed to go the Flyers’ way. "Rick was OK tonight," coach Ted Nolan said. "When you're so used to seeing a star performance, anything else is not normal, but I think once he gets his groove going he'll be all right." Martin Biron made 32 saves for the Flyers and beat the Islanders for the fifth time in five tries this season. The Flyers were skating 5-on-3 when Danny Briere opened the scoring 2:48 into the second period. Briere had an open net to shoot at after Islanders forward Richard Park misfired on a clearing attempt and deflected the puck onto his stick. Jeff Carter made it 2-0 at 12:06 when he swatted home Scottie Upshall’s backhand pass after DiPietro stumbled behind the net tying to clear the puck. It was Carter’s seventh goal in seven games since center Mike Richards went down with a hamstring injury. Hartnell’s deflection beat a screened DiPietro at 7:22 of the third period, and after Freddy Meyer scored for the Islanders 23 seconds later, Hartnell got his second of the night on another deflection at 13:18. "They have a very good power play," Nolan said. "Usually our penalty killers are one of our strongest points, but tonight you have to give Philly a lot of credit. Penalties were a big part of this game. You have to be disciplined. There were a couple of penalties we took that didn't need to be taken. Against a good power play it's going to hurt you." Meanwhile, the Islanders continue to drop in the East, largely thanks to their own ineffective power play. They were 0-for-5 against the Flyers and are just 2-for-46 with the man advantage in their last 11 games. ''It was tough before the game and now it's even tougher,'' Nolan said of his team’s playoff hopes. The Hurricanes capitalized on a chance to put some more space between themselves and Washington in the Southeast Division when Scott Walker deflected Eric Staal’s power-play shot into the net with 2:10 left in overtime. Where the Hurricanes stand now is seven points ahead of second-place Washington in the division. Aucoin, Tim Gleason and Sergei Samsonov also scored for the Hurricanes, who won for the seventh time in eight games. The loss was painful for the Sabres, who fell four points behind eighth-place Philadelphia in the East. Carolina grabbed a 2-0 lead when Aucoin scored at 16:35 of the first period and Gleason beat Ryan Miller 26 seconds later. Roy poked a loose puck past Cam Ward at 7:46 of the second period, but Samsonov capitalized on the rebound of Staal’s shot 66 seconds later to make it 3-1. Ward got caught out of position late in the period and Drew Stafford knocked a loose puck into the net at 18:07 to cut the margin to one goal. Defenseman Toni Lydman tied it at the 10-minute mark of the third period, poking a rebound into the net after Ward lost his stick. Sabres goalie Ryan Miller kept the Hurricanes off the scoreboard despite two Carolina power plays late in regulation, but was helpless on Walker’s game-winner. "It was kind of a playoff game," Buffalo forward Maxim Afinogenov said. "They are playing for the playoffs, we are fighting for the playoffs. It's tough right now." Nathan Horton’s overtime heroics are keeping Florida’s playoff hopes alive. Horton got his second OT goal this week when he connected with 23 seconds remaining in the extra period, giving the Panthers their fourth consecutive victory. The Panthers remained six points behind Philadelphia for the final playoff berth in the East. They’ve won back-to-back home games and play their next five at BankAtlantic Center. Horton scored during a 4-on-3 power during overtime when he fired a slap shot from the right circle over Kari Lehtonen's left shoulder. The Thrashers are next-to-last in the East with 68 points, 10 out of a playoff spot, despite grabbing a first-period lead on goals by Bryan Little and Ilya Kovalchuk. But it was Kovalchuk who hooked Jay Bouwmeester with less than two minutes left in overtime, giving Florida a power play. Florida went back to All-Star goalie Tomas Vokoun after backup Craig Anderson played and won three straight games, recording back-to-back shutouts on the road. Vokoun allowed a goal on his first shot when Little scored a power-play goal at 2:12 and another when Kovalchuk scored with the man advantage at 16:53 to make it 2-0, but was perfect the rest of the way and finished with 25 saves. The Panthers got one goal back at 18:32 of the first period. Lehtonen made a pad save on Brett McLean's wrist shot, only to have the rebound bounce into the net off the skate of Thrashers defenseman Ken Klee. McLean scored again at 8:40 of the second when his flip from the back of the net went in off the back of Lehtonen's leg. The comeback from a two-goal deficit was the Panthers' first since Jan. 2. The Thrashers lost for the 10th time in 11 games. They snapped a nine-game losing streak on Friday night with a shootout win over Minnesota at home. Lehtonen lost his ninth consecutive decision. The Canucks moved back into a tie for the final playoff spot in the West when Brad Isbister broke a 2-2 tie with 4:12 left in regulation and Roberto Luongo helped Vancouver kill two power plays in the final three minutes. Isbister, moved onto a line with Alex Burrows and Ryan Kesler before the third period by coach Alain Vigneault, finished off a brilliant three-way passing play by burying a shot into a wide-open net for his fifth goal of the season. Luongo did the rest with a handful of key saves, including one on a stuff try by Andy McDonald, before Henrik Sedin slid the pick into an empty net with five seconds left. The Canucks and Nashville Predators both have 78 points. Nashville has one more victory; Vancouver has a game in hand. The Canucks are two points behind Calgary, Minnesota and Colorado in the battle for first place in the Northwest Division. The Blues remained 14th in the West, 10 points out of a playoff spot, and dropped to 1-7-1 in their last nine games. They are 0-2 on their nine-game road trip. Defenseman Mattias Ohlund, a surprise starter just three days after an MRI revealed bone chips in his left knee, opened the scoring for the Canucks at 6:30 of the opening period. His slap shot during a 5-on-3 power play hit a Blues defenseman and went into the net. Brad Boyes ended an eight-game goal drought when he rammed home Keith Tkachuk’s passout at 15:05 and put St. Louis ahead at 12:46 of the second period when Canucks defenseman Alex Edler knocked his centering pass into the net. It was his career-high 34th of the season. Burrows tied it at 15:58 when he beat Manny Legace with a backhander on a breakaway. Material from wire services and team broadcast media was used in this report.